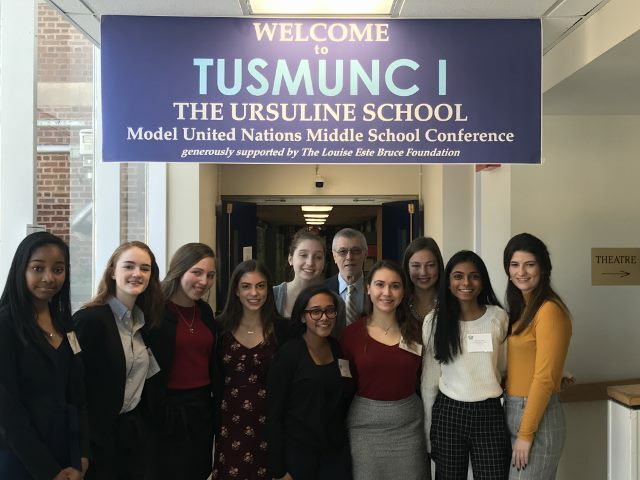 TUSMUNC I, Ursuline’s first Junior Model United Nations Conference that took place on November 17, 2018, was an absolute success. 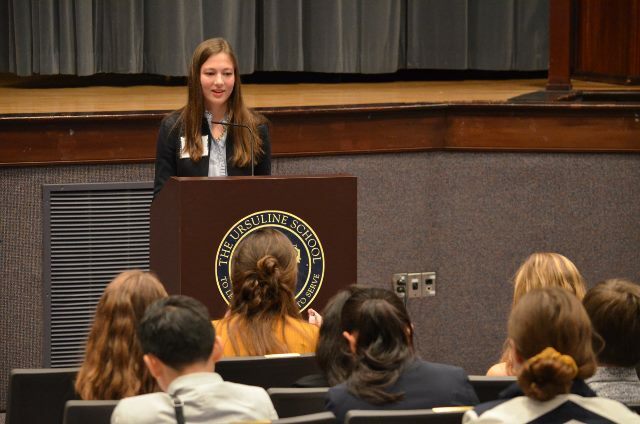 Eighty delegates debated issues in 4 Committees: Roman Senate, Security Council, The Lorax, Captain America:Civil War representing fictional universes as well as real world examples of division and reconciliation. 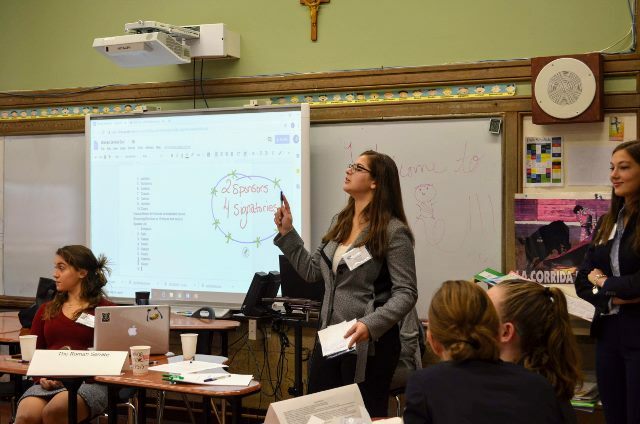 Thank you to The Louise Este Bruce Foundation for their sponsorship of this inaugural Middle School Conference at Ursuline. At the Opening Ceremonies, guest speaker Ken DeLuca shared his experiences as a lawyer in Afghanistan. He told of learning how to respect other cultures and values in order to reconcile differences between peoples. His words underscored the message that junior Stella Banino gave in her welcome address as Secretary General of TUSMUNC I. Ken is pictured above with the Secretariat and the Committee leaders. The delegates took that message to heart as they spent the rest of the day in committee sessions, listening and following parliamentary procedure. Afternoon action at TUSMUNC I included numerous new solutions as well as challenges posed by the Crisis Committees. The Security Council Committee voted to give aid to North Korea in order to stop riots. The Roman Senate Committee was cheered by the plebs upon the dissolution of the Senate. Captain America Committee was told that in another country people were being harmed but the government was not allowing the Avengers to help. The Lorax Committee agreed to establish effective trade and stabilize environmental protections. The delegates are commended for how they worked together. They learned a lot to go forward as active world citizens!